Tiny Prints is always my first choice for holiday cards. I've ordered our Christmas cards from them for the past 4 or 5 years and have always been thrilled with the results. 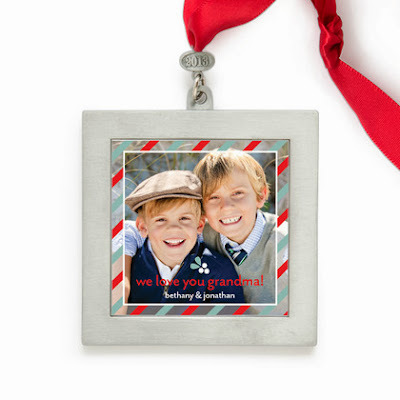 Every year, there are new designs and fun ideas for a twist on classic holiday greetings, gifts, and stationery. Here are my favorites from Tiny Prints this year. The Stark Square card is modern and elegant. I love the simple typography on the front paired with the design on the back. So chic! I could spend hours on Tiny Prints' website because there are so many new design styles for 2013 – Contemporary, Classic, Vintage, Full bleed photos, All That Glitters, Bold Expressions, Simply Chic, Woodland Wonder and The New Tradition. This Shimmering Brocade holiday card is a stunning option. Once you've found your favorite card, decide on a special shape. New trim options for 2013 include square, rounded, bracket, ticket and scallop options. Here's what I'm thinking about using for our holiday card this year. Before you finish your order, remember to include matching address labels and envelope liners to make your cards extra special. Here's the good news for you! Enter to win $50 towards your next Tiny Prints order with this flash giveaway. Use the widget to enter to win and get a head start on holiday planning. Enter to win today because the giveaway ends on Friday night at 11:59 p.m. I really like the Christmas Crest! I always love your Christmas cards! I like the Swaying Garland best as well, but also think the Yuletide Cheer and Adorned Ornaments are cute! How do you pick just one?! Oh pick me, pick me! I love the scalloped trim! I love Tiny Prints especially the fun new holiday trim options! The merry scribbles card is one of my top picks for the holiday. I love Tiny Prints. We always use them for our holiday cards. 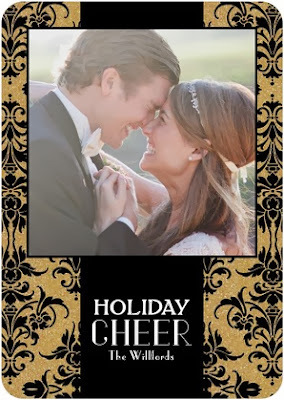 Yuletide Cheer is so cute and would be a great choice. I like the photo gifts! love the Glitzy Giggles card! Spirals Photo Mount is beautiful..too many to pick just one! Love the gold on the Glitzy Giggles. I liked the Golden Greetings....such a pretty touch on the back. Thanks, Bethany. Such a fabulous giveaway! 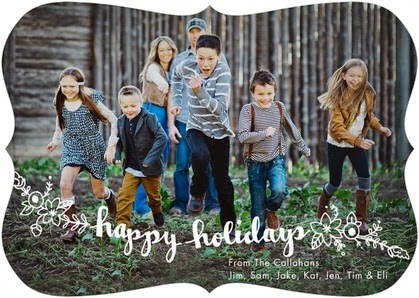 I love the MERRY BOKEH: BLACK FLAT HOLIDAY PHOTO CARDS. Sprinkled with joy is darling. I also LOVE LOVE Golden Holiday! How could I choose only one?? I plan to use a photo of my pups in their Christmas garb (which I have yet to take). So my final choice will be dependent on the colors I think jump out best!